If you’ve been following this blog for any time you’ve heard me talk about “light.” Not just any light, but rather that special soft light that brings a photograph out of just about any scene. An unfortunate realization, to many new to landscape photography, is that the best light often comes during the worst weather. In a place like Yosemite, rain chases the tourists back to their car but it shouldn’t chase you away if you’re carrying a camera. You do have to protect your camera and there are certainly limits to the obsession. Standing, camera in hand, out in a sideways driving rain isn’t my idea of fun. 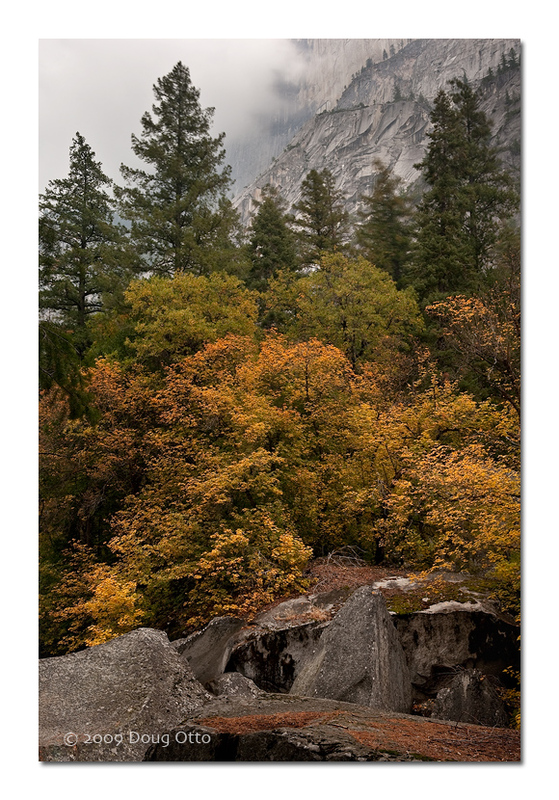 I took this shot on one of the fall yosemite workshops last month. It had started to rain and despite being told to prepare for anything, most of the group was wanting to pack it in. Adding to the feeling was the group leader, Gary Hart. He had just tried to stick a triple-gainer into Tenaya creek. Gary, not as nimble as he once was, missed the landing and came up lame. While we waited for other to make it down the hill, the clouds dropped in a bit and it started to rain. The soft light from the clouds and the saturation of color that rain brings made the scene. With a bright blue sky I wouldn’t even have bothered to take out my camera. Before you head out for that next shoot, make sure that you’re prepared. If nothing else, throw a clear plastic bag in your camera case. When that magic light starts happening, you don’t want a little weather to chase you indoors. This entry was posted in Photography and tagged Canon 5D, clouds, doug otto, fall color, half dome, mirror lake, mist, yosemite, yosemite national park. Bookmark the permalink.